Austin Singers, the Austin Community Choruses, and Brass Ensemble present Rutter’s Gloria and Britten’s Ode to St. Cecelia along with works by Vaughan Williams, Purcell, and The Beatles. 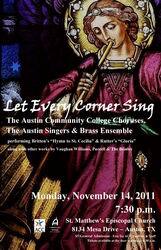 Monday, November 14, 2011, at 7:30 p.m.
Sign Language Interpreter Provided Upon Request. Contact aint@austincc.edu or call 512- 223-6151 at least 48 hours prior to the event.